sailboat. : The art of putting things off... & a question! The art of putting things off... & a question! 1. Tweak blog design - I'm thinking something a little more simple. 2. Finish Sharp Objects by Gillian Flynn - I'm not that into it, more a reflection on me right now than the book I think. 4. Buy more fairy lights. Cold, rainy nights call for an abundance of fairy lights. How do you subscribe to blogs? Do you still rely on google friend connect or have you moved on to another method? I'm considering removing my Friend Connect widget during my next design tweak, so I was a little curious as to how you prefer to keep up with your favourite blogs. Personally I'm well and truly on the Bloglovin' bandwagon! Good luck with the essay writing. I use Bloglovin to follow blogs; when Google Reader closed I found it was the service that ticked most of the boxes for me. I know there are lots of others - Feedly for example. I don't use Google Friend Connect at all. Thankfully with a blog RSS feed readers can use pretty much whichever service they like. I am the worst for procrastinating, I once rearranged and tidied all my cupboards, alphabetized all my books and DVDs and cleared out my wardrobe so I didn't have to write an essay...oops! I always find myself doing this! When something needs to be done you can never concentrate on anything out! Ohh I love the fairy lights and of course you need more - when you're finished with your essay of course! Good luck getting the essay finished! I only ever use Bloglovin. It's so useful to have them all in the same place and have a timeline of my favourite blogs that I usually read through with a brew :) I was the same with essays always putting them off but now I've left uni for a few years I miss essays so much and I'd love to go back and do it all again, but that doesn't help when you're there at the time sitting at a blank screen does it lol! I want to put fairy lights up around our house too! I'm on the bloglovin bandwagon, so useful! I'm still subscribed to GFC but never really use it. I use bloglovin mainly now (I follow you on there) but still use feedly to read my old reader subs that I would miss and am too lazy to add to bloglovin, plus sometimes its just easier to scroll down through the reader than clicking to each blog on bloglovin! I have an essay due in a few days and have only written half, and here I am, reading your blog! Def know the feeling!! I'm the same, can't ever focus on essays and things! Ha this is like reading about myself - I'm probably the biggest procrastinator I know. And buying more fairy lights is never a bad thing! I know what you mean Jennie, the second I need to do something vital, a load of other things start popping into my head that I just can't resist doing! 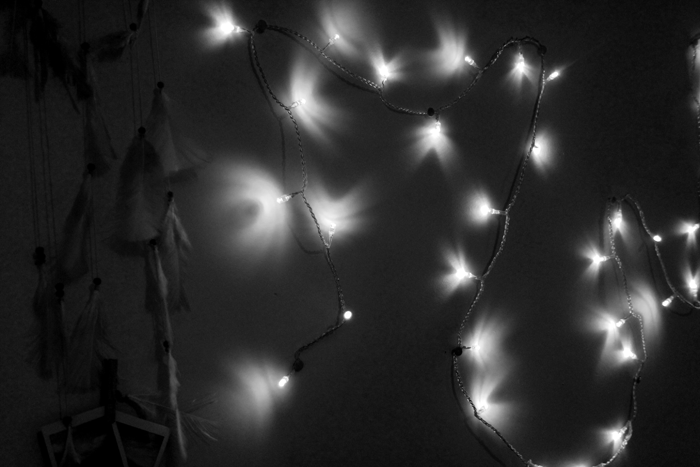 Your fairy lights are SO pretty xo Must say I go with Bloglovin. If you could be a professional procrastinator I would be one, a really successful one. I'd earn millions! I'm well and truly on the Bloglovin' wagon. I haven't used GFC for ages. I absolutely love fairy lights...they make a room look so much prettier and just give it a cosy atmosphere! I love bloglovin and Stylight at the moment but still use GFC too! I am the worst for procrastinating. It's a habit that I'm really trying to break! I only use Bloglovin to read blogs anymore. I used to use Google Reader, and it's the closest in format I think. Haha - totally know how you feel about coursework. I find the best way to do it is just to get up, have breakfast and get on with it asap! I am not one to put things off :-) Drives me crazy. I'd rather just do it and be done with it. Amd as for the following thing, I use Bloglovin. I use Bloglovin and have done for about 2 years. Its much easier than GFC. I use bloglovin for new blogs, but for blogs I've already used GFC to subscribe with I just stick with that. When I was in school I would also find myself busy with everything around me rather then school work. I would wait to the very last minute until I had to actually get it done. You're not the only one :) Btw- love the fairy lights! I was going to read Sharpe Objects but, if you're not into it maybe I wont be either. Bloglovin' is where I catch up on all my blog reading ( following you). I would love for you to check out my blog. Good luck with the essay, I know how hard it is to just sit down and do what you have to do when there are books to be organized and fairy lights to be hanged (not that kind of hanged). I think I'm the only one but I prefer gfc! I use feedly to follow all the blogs I love, I like the fact that it tells you how many posts you have yet to read. Review: W7 Candy Floss Brightening Face Powder. Bookshelf: Gone Girl by Gillian Flynn. The High-End Tag: Favourite Luxury Make Up. Jouer Cheek & Lip Tint in Honeysuckle. Books Are My Bag: A Celebration of Bookshops! Love Me Beauty Box: October 2013. Bookshelf: I Wished For You by Amy Huberman.